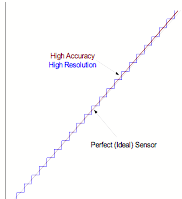 PURPOSE: To describe the difference between "accuracy" and "resolution" for silicon based pressure sensors. Silicon based pressure sensor inherently have infinite resolution. The limit to the practical use of this limitless resolution is based upon many factors associated with the compensation and amplification of the output signal and the accuracy demanded by the application. All the figures show an output signal where the output of the sensor is displayed as a signal quantized (stepped) by an analog to digital converter after some amplification of the pressure sensor signal. For ease of display the steps are relative to each other and not representative of a typical system. For instance a relatively low accuracy system would be an 8-bit system resulting in quantization of the signal into 256 steps (28). 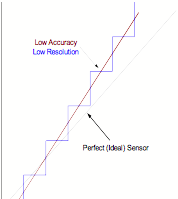 As a practical matter for today’s sensors and added electronics the limit to the resolution with accuracy acceptable to most applications is roughly one part in sixty thousand, or a 16-bit system (216). For such a system the analog to digital converter would be somewhere between 18-bits to 24-bits. 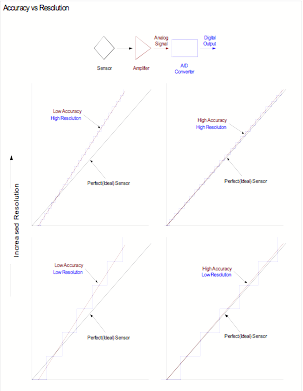 Figure 1: Provides an example of a sensor signal with both a large offset error and a sensitivity error but having high resolution. It’s difficult to imagine an application where such a signal would be of practical use. Figure 2: Displays the same output signal as figure 1 but with low resolution. 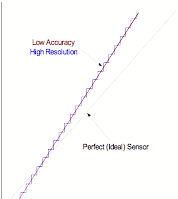 Figure 3: Displays a low resolution output but having high accuracy. 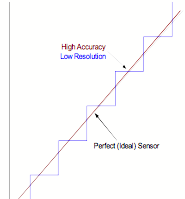 Figure 4: Displays a high resolution output signal having high accuracy.